Holding your tiny bundle of joy, you marvel at their fragility. You are in awe of this super sensitive tiny being and would go to any lengths to protect them. You want to cocoon them in a blanket of care, health, and safety. In your desire to shower them with the best of every comfort, you have probably been buying baby care products from some of the biggest brands on the market. But did you know that in 2016 and 2017, one of the major baby product brands (Hint: yes, it’s most probably on your shelf, too!) shelled out more than $700 million in ovarian cancer-related lawsuits because of talcum powder! Yes, it’s shockingly true! Now, you wouldn’t want such things near your baby’s tender tushie, right? Do not despair! For we bring you excellent natural alternatives for powders that are not only safe but also equally effective for your babies’ tender skin. 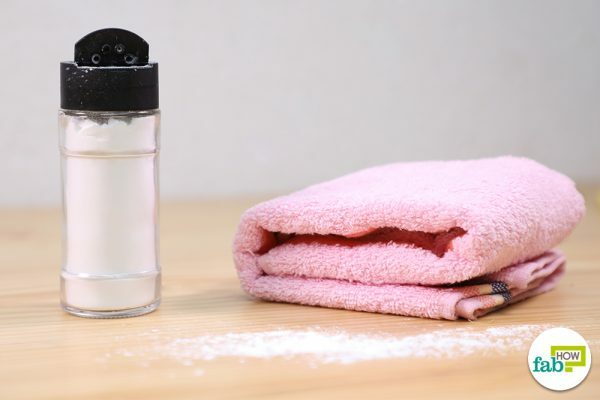 Here are three easy recipes for homemade baby powder for your baby's soft skin. 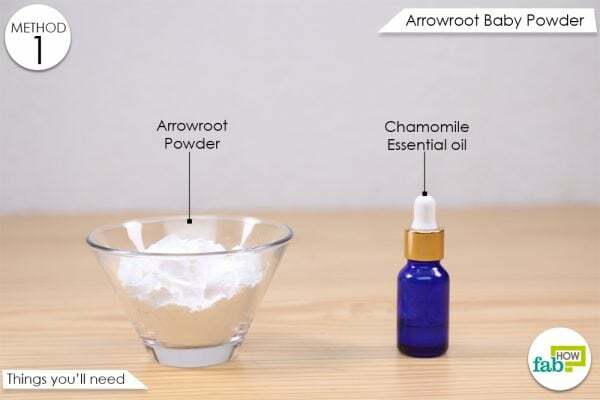 Arrowroot baby powder is the easiest possible baby powder to make, and it’s equally effective as the go-to brand baby powder. Arrowroot powder is a white, flavorless powder made from the starch of the arrowroot plant. This lightweight powder, when applied to the skin, gives it a soft and smooth feel. It absorbs excess moisture from the baby’s body and helps prevent the baby’s skin from rashes or infection. 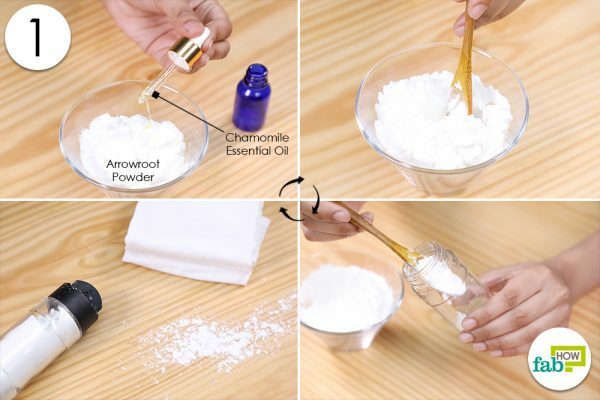 You can use either arrowroot powder or even organic cornstarch as a base for your baby powder. Chamomile is a gentle essential oil that has natural soothing effects and is traditionally used to treat insomnia in babies. This essential oil has also been known to help alleviate anxiety and can uplift a fussy baby’s spirits. You can also use chamomile to make homemade baby wipes for your little one. You need only two ingredients to make this baby powder, and it is ready to use within 5 minutes! Take a ½ cup of arrowroot powder. Add a drop of chamomile essential oil to it using a dropper. Mix the combination well using a spoon. Store the powder in a sugar shaker or a glass jar. Use it like you would any other baby powder. Arrowroot powder in itself can be stored for a long period, but because you are making this powder for the supersensitive skin of your baby, we suggest that you make small batches of it, which you can replenish every week with a freshly made powder. 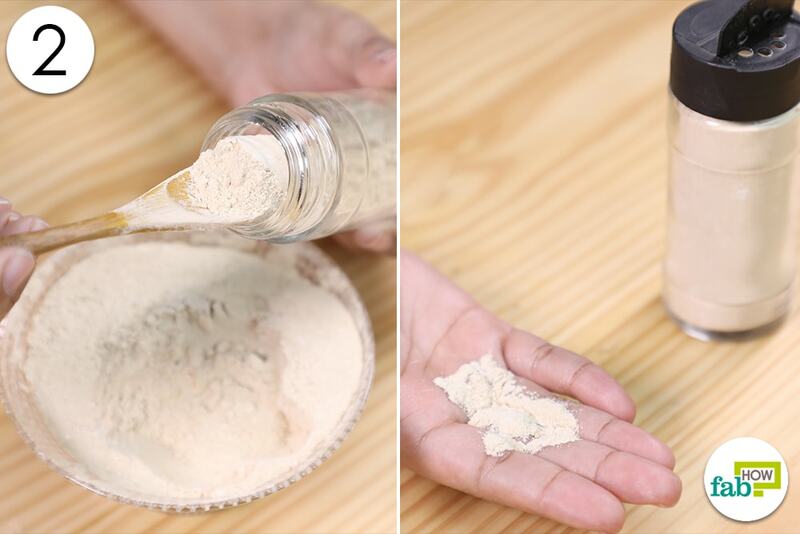 The main ingredient of this baby powder is bentonite clay powder. 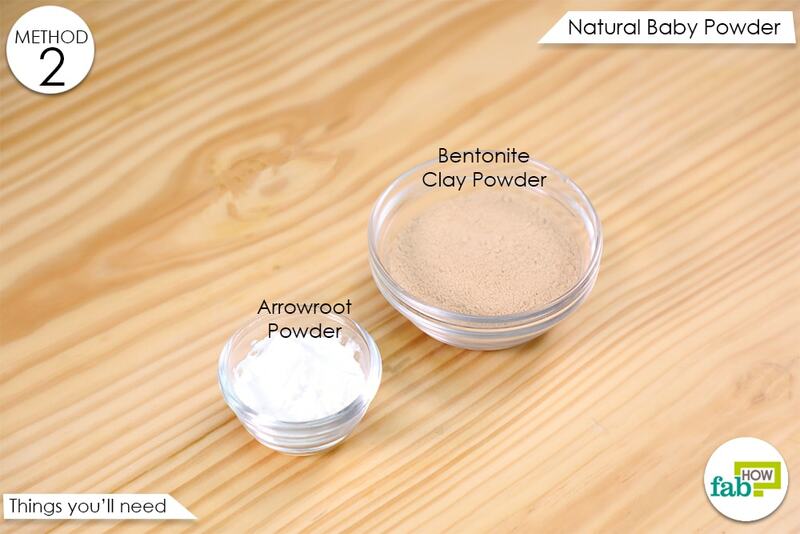 Bentonite clay, a very popular healing clay, also called montmorillonite. It is rich in minerals like iron, sodium, calcium, potassium, and magnesium. This clay is excellent for your baby’s bottom. When dry, bentonite clay is hydrophilic, i.e., it is water loving. So, when it is sprinkled on the highly sensitive skin of your baby, it draws the moisture from the skin to itself. This provides a wonderful relief to your baby, especially when already experiencing a rash. It even helps prevent rashes from happening in the first place by drying moist skin and acting as a moisture barrier. You can mix arrowroot powder also with this clay powder. 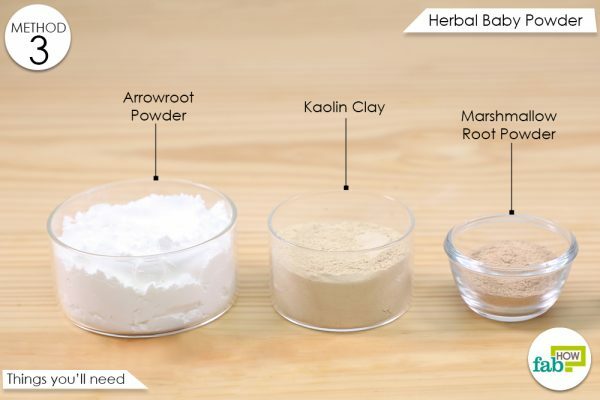 Arrowroot powder makes the skin texture of your baby even smoother and silkier. 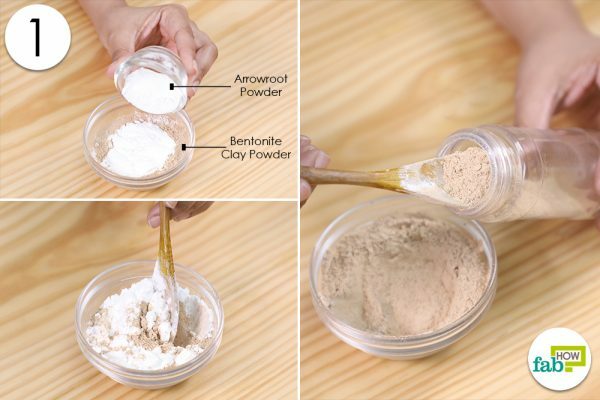 Put 1/4 cup of bentonite clay powder in a bowl. Add 1 tablespoon of arrowroot powder to it. Transfer the powder into a clean glass jar. Powder lightly after you change your baby’s diaper. This herbal baby powder is one of the best homemade baby powders you can make for your little angel. 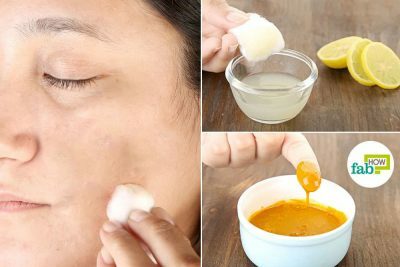 It uses natural ingredients like arrowroot powder, kaolin clay, and just a few drops of essential oil. 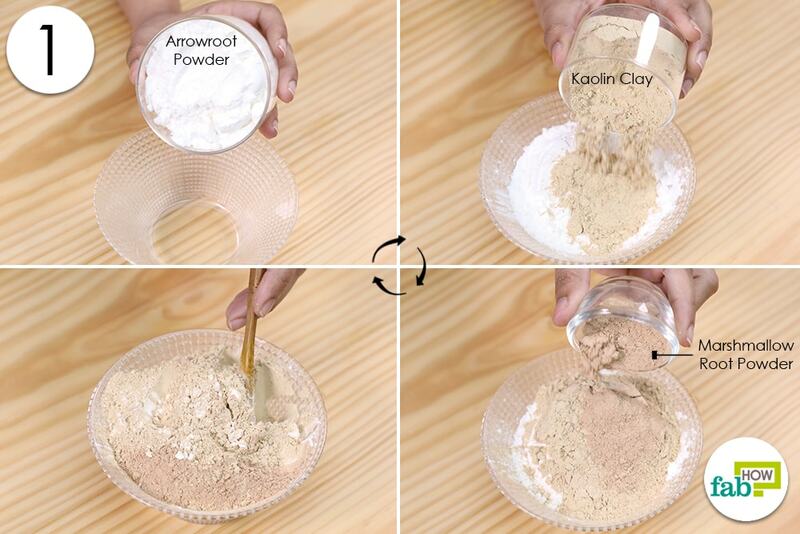 Kaolin clay makes an excellent base for a body powder. It is naturally absorbent and is one of the mildest of all clays. This antimicrobial clay treats contact dermatitis and skin irritations by soothing the skin. You may also include marshmallow root powder in this recipe. Marshmallow root is a top pick for treating inflammation and irritation. It helps in preventing and healing diaper rash. As a natural emollient, it holds the moisture in and acts like a protective layer to your baby’s skin. Add arrowroot powder, kaolin clay, and marshmallow root powder to a bowl. Whisk the powders together until they are of a uniform color. Store the powder in an airtight container. Make sure the container is sterilized and completely dry from the inside. Sprinkle the powder liberally on your baby's bottom to keep them comfortable, dry, and smelling sweet. Keep the powder away from moisture. If it is properly stored, the herbal baby powder will last up to six months. 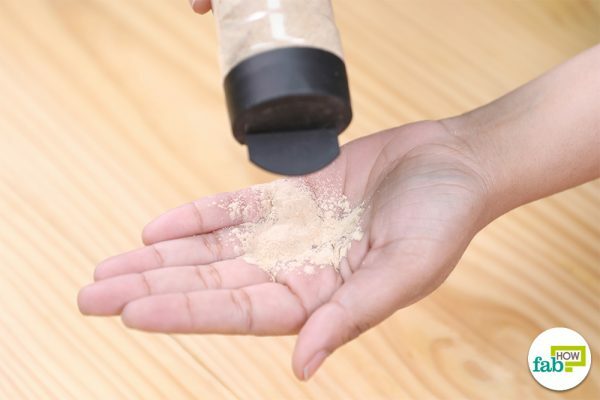 Using these natural homemade baby powders will help absorb moisture and reduce the chances of diaper rash and other skin irritations, like chafing. In fact, you could even enjoy these baby powders on yourself. Always make sure containers and utensils are sterilized, especially when preparing remedies for infants. For the first use of any ingredient always do a patch test to make sure there are no undesirable reactions, contact your baby’s physician immediately if symptoms do not subside quickly. Powders are recommended only for babies older than 3 months. Babies under three months have delicate immune systems and can easily inhale the particles of the powders into their sensitive lungs and cause complications. Don't allow the powder to build up. Every time you change the diaper, wash away any powder that has accumulated, especially in the folds of your baby’s skin, and pat dry to prevent skin irritation. If you prefer homemade products, you might want to give all natural baby lotions a try too. You must ensure that the powder container is kept well beyond the reach of your baby or his/her siblings. If the container gets accidentally knocked over, it will produce a cloud of fine powder that can be very easily inhaled. Check the product labels of essential oils to make sure you are using a pure, authentic, unadulterated essential oil. Oils that have been premixed with alcohol can cause irritation for the baby. Avoid using synthetic fragrances, which are entirely different from essential oils and don’t carry any health benefits and can irritate sensitive skin.